We are one of the very few tours that actually has full commercial vehicle and liability insurance. They know we're storm chasers and we pay for that coverage. Safety is a priority. We know when it's safe to get a bit closer, and when it's best to stay back, but we'll always work our hardest to see tornadoes. We avoid budget hotels and instead prefer to stay at places befitting your hard earned vacation. If you have been on a tour with Weather Adventures, please write a review. I have been on two tours with Blake. Both were out of this world enjoyable! Not only did we catch some absolutely beautiful storms (with two photogenic tornadoes!) and got to meet some great fellow weather enthusiasts, we also enjoyed the relative road luxury of Blake ensuring that we stayed at clean and reputable hotels during our journeys. For our meals, our tour dined at some pretty nice establishments...very little fast food dining on this trip except on the days when we needed to be somewhere quick. As for the action segments of our tours, Blake always ensured that we were placed in a safe location that also provided for excellent viewing of the storms we pursued. He is extremely knowledgeable about forecasting setups and is more than willing to share that knowledge by explaining some of the finer points of forecasting using models while on the road. I will continue to be a repeat customer of Blake’s as touring with him is the most fun I’ve had on any group tour, chasing or otherwise! I have just finished tour 5 and it was an awesome 10 days!! I chose weather adventures because a friend told me how good they were and he was not wrong. 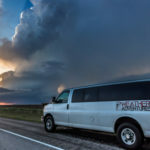 I have chased with a few groups over the years but due to home circumstances this was my last trip to tornado alley and I am glad it was with the weather adventures team! The weather pattern over the 10 days wasn't that conducive for big storm outbreaks and the guides had to work really hard to find storms but we chased every possible setup from the deep south of new mexico and Texas to the north of Wyoming and south Dakota. We saw storms everyday including numerous epic supercells finishing with the dream storm in Colorado that dropped 7 beautiful tornadoes which we watched from the perfect vantage point. The driving and forecasting is shared between Ryan and Blake. They have a good chemistry between them which works well, Ryan absolutely loves pouring over weather data and blake uses his spot on intuition as to how storms behave. We were also joined by Colt and Lauren Forney for some of our chases and their storm chasing reputation precedes them. The service before and during the tour was faultless and blake works himself into the ground to make sure everyone is happy and the hotels were really nice. There wasn't as much educational stuff as you get with other tours probably due to the fact we were traveling so much but blake and Ryan love nothing more than answering questions and Lauren gave us `on the road" instruction on how to use models and interpret data which was cool. The van is nice and drives really smoothly which is important when you clock up in excessive of 4000 chase miles in a tour. It also has wifi that you can actually sign into when on the road meaning you can upload all of your storm footage onto facebook straight away!!! Weather adventures provided me with an exceptionally professional service. Hitting every major storm during the 2 weeks. 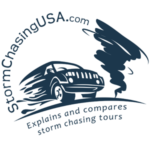 The tour guides are veteran chasers forecasters and photographers. All of our tour ended up extended our stays. Some for a few days and some for another entire tour. The team worked around us to make sure we all had a great time and having been on other tour operators i can say these guys were the best. The small groups of 6 (although the owners used to handle 14+ people) is a great size for chasers as it's very easy to get going when required without spending time loading up. I can not commend these guys enough. Give them a go! You won't be disappointed. The tour guides were always willing to go above and beyond for the tour guests. They got us to the positions we needed to get our photos and videos. Driving us from the mexico border to Canada in 3 days. That is commitment! They would also make sure all guests were comfortable and happy. They would share their knowledge and if they could help us with our footage they would step in as assistants. They would make sure we were safe but close to the storms. Take us to get supplies if a guest was missing something even after we had finished for the days. Brand new air-conned vehicle. Plenty of power points for everyone. WIFI is available when we were in service which was most of the time. I was very happy with my tour experience. Saw 2 EF2 tornadoes in Missouri and got to feel the inflow from a rain wrapped EF3 tornado in Nebraska. The rooms we stayed at were very nice. The places we ate at were great. Also for 5 days there were no storms so they took me sightseeing from Oklahoma, Texas, New Mexico and Colorado. Saw some amazing places and had the adventure of a life time. Blake Knapp and Dave Holder were the best tour guides. Very friendly, funny, informative and would answer any question I asked of them. They made the best out of the weather that was there. First tour and I see two tornado, you can't bet that. I highly recommend them. Four hours on a plane killed my back but the van was very nice and compatible. Had wifi, they provided free water or you could put what kind of drinks you wanted in the cooler. They went way out of their way to give me the best tour experience. For other people I can only say choose weatheradventures and have the time of your life. Take a sweater, it's gets a little chilly when the wind is blowing. Being my first time with severe weather chasing, I wasn't sure what to expect. Communication before the tour was informative and fast. The operators were professional and knowledgeable. The accommodations were excellent! The chasing was exciting, and when there wasn't a storm to chase, there was always something to see. The chase van was roomy and comfortable, and there were ample power ports for all my charging needs. The tour was great and I will definitely be visiting again! Blake is a friendly, professional, and knowledgeable tour guide. If I had a question, he had an answer. He explained all the features of the storms we chased before, during, and after. He wasn't only knowledgeable about weather and chasing, but also with photography. As this was my first time photographing severe weather, he was a great teacher. The chase van had ample room for everyone, and was very comfortable. There were lighter plug adapter ports for each row of seats, which helped me keep everything in good charge. The driver was an experienced chase driver, and I felt safe and secure during chases. Try the rest now try the best...... I have been on other tours with the big company's before but this is by far the best you don't feel like a number you are made to feel like part of the group and part of the tour I guarantee you will not be disappointed.....!!!! Like I say i have been on tours before and have always enjoyed myself but this one was buy far the best!!! As with any storm tours you will spend many hours on the road and this is really no problem. Blake and Ryan are always keeping you updated of progress and developments and are always happy to make stops when needed. throughout the tour you are made to feel happy asking questions is always welcome and things are explained in a way you understand. But if you want to just sit back and relax and have no interest in the tech side than that's fine too. You always stay in really nice hotels normally with a pool and are always very clean and tidy. When chasing is over for the day you get to get a good meal normally with a bar and again always decent places..... one thing the WA team can be sure of I WILL BE BACK!!!!! I did a tour with them. I forgot to add that when deciding on what tour to go with, ask if they have insurance on the passengers. weatheradvenures does.